1947: Gordon Onslow Ford moves to the Bay Area. According to the group [Ford, Paalen and Mullican], the Dynaton (from a Greek word meaning "the possible") was a transformative art, a fusion of the artists' interests in pre-Columbian and native American cultures, shamanism, non-Western philosophies such as Zen Buddhism, the new physics (particularly wave-particle theory), and extraterrestrial life, all in an essentially meditative framework. The artists of the Dynaton espoused the principles of European surrealism—automatism and the primacy of the unconscious—and the vital quiet in California nature as their points of departure. 1947: Max Ernst and Dorothea Tanning move to Sedona, Arizona. 1947: Philip Guston and family return to Woodstock from St. Louis. January 6 - 25, 1947: Adolph Gottlieb exhibition at the Samuel Kootz Gallery. January 14 - February 1, 1947: Jackson Pollock's fourth solo exhibition at Peggy Guggenheim's Art of This Century. January 20 - February 8, 1947: Barnett Newman curates "The Ideographic Picture" exhibition at Betty Parsons. January 27 - February 15, 1947: Picasso's first post-war exhibition in the U.S. takes place at the Samuel M. Kootz Gallery. Kootz was for a time Picasso's exclusive dealer (see spring 1948) in the U.S.
February 1947: Joan Miró arrives in the United States. Miró stayed eight months. (HH540/SS403) He had come to the U.S. to paint a 7 by 32 foot mural commissioned for the Terrace Plaza Hotel in Cincinnati. Carl Holty loaned him a studio to work in. Soby arranged for the completed mural to be exhibited at the Museum of Modern Art in October prior to its installation in the hotel's dining room. (SS403) He stayed eight months. Although the exhibition consisted solely of drawings, Gorky managed to finish about twenty-five paintings in the first ten months of 1947, according to Matthew Spender. March 12, 1947: The "Truman Doctrine" speech furthers the Cold War. March - April 1947: "Introduction a la peinture moderne americaine" exhibition at the Galerie Maeght, Paris. The characterization of the artists as lonely annihilators of their past in the midst of the anonymity of New York made them sound like existential heroes. The fact that they came from America was almost irrelevant as, according to Rosenberg, the "international idiom of twentieth century painting" belonged to "no one country," presumably including France. The "transcendental world-style" of the Americans failed to impress most French critics. André Warnod wrote of the show in the April 3rd issue of Le Figaro, "In no case is any comparison with French painting possible." (Le Figaro, April 3, 1947, p 2/SG152) Denys Chevalier was equally critical in the April 4th issue of Arts magazine. Spring 1947: Freedom Train organized by Clark and J. Edgar Hoover. April 1 - May 4, 1947: "Large-Scale Modern Paintings" exhibition takes place at The Museum of Modern Art. 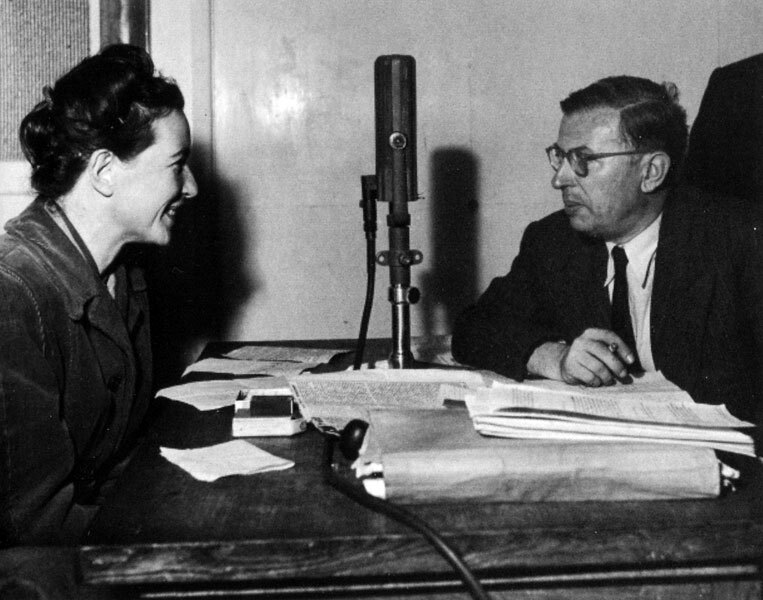 April 17 - c. May, 1947: Jean Paul Sartre's The Flies on Broadway. April 28 - May 17, 1947: Robert Motherwell solo exhibition at the Samuel M. Kootz Gallery. May 1947: Jean-Paul Sartre criticizes the Surrealists. Sartre accused the Surrealists of colluding with the very people they criticised - the bourgeoisie. c. End Spring 1947: Barnett Newman quits. Pollock utilized his paint dripping technique while working on canvases for his first exhibition at Betty Parsons' gallery. Art dealer Samuel Kootz later recalled that Hans Hofmann had also dripped in 1940. Kootz signed Hofmann to his gallery in 1947 and also the idea of action painting derived "particularly from Hofmann." Although Kootz credits Hofmann's painting style with some of the attributes of what was later referred to as "action painting," Jackson Pollock never studied under Hofmann - although his wife, Lee Krasner, did. Pollock explained his approach to painting in a statement that appeared in Robert Motherwell's Possibilities magazine later in the year. My painting does not come from the easel, I hardly ever stretch my canvas before painting. I prefer to tack the unstretched canvas to the hard wall or the floor. I need the resistance of a hard surface. On the floor I am more at ease. I feel nearer, more a part of the painting, since this way I can walk around it, work from the four sides and literally be in the painting. This is akin to the method of the Indian sand painters of the west. I continue to get further away from the usual painter's tools such as easel, palette, brushes, etc. I prefer sticks, trowels, knives and dripping fluid paint or a heavy impasto with sand, broken glass and other foreign matter added. Rothko taught at the school during the summers of 1947 and 1949. During the time he taught there the faculty included Elmer Bischoff, Edward Corbett, David Park, Hassel Smith, Clay Spohn and Clyfford Still. Graduate student Richard Diebenkorn taught at night. Rothko taught a studio class for advanced students three mornings a week and gave a one hour lecture one afternoon a week. While Rothko taught at the school he stayed in a wooden Victorian house on Russian Hill (2500 Leavenworth Street) (RO611fn77) - a considerable improvement on his small New York apartment over the fish restaurant. Summer 1947: Clyfford Still solo exhibition at the California Palace of the Legion of Honor in San Francisco. June 5, 1947: George C. Marshall launches the Marshall Plan. June 30, 1947: Barnett Newman's father dies. c. July 1947: Arshile Gorky sells Torso to Mina Metzger for $1,200. July 7, 1947: "Exposition Internationale du Surréalisme" at the Galerie Maeght, Paris opens. [Note: Martica Sawin gives two dates for the opening of the exhibition. On page 395 of Surrealism in Exile and the Beginning of the New York School she indicates it opened on July 8th. On page 398 she mentions that it opened on July 4th. On page 400 she indicates that the exhibition closed on October 5, 1947 although she also mentions a letter from Breton to Donati dated September 14, 1947 in which Breton apparently refers to the show in the past tense. Sawin writes that in his September letter Breton "admitted that the exhibition had not been a succes d'estime and certainly not a financial success." (SS400). The "Selected Exhibitions" list in the Matta exhibition catalogue Matta Coïgitum gives the dates for the exhibition as July 7 - August 7, 1947. The Calder Foundation also gives the opening date of the exhibition as July 7th. The show was the second exposition of Surrealism in Paris - the first had taken place January - February 1938 at the Galerie des Beaux-Arts. The catalogue for the exhibition (as well as the exhibition itself) is sometimes referred to as Le Surréalisme en 1947. A limited edition of the catalogue featured a rubber breast on the cover. Although meant to reinvigorate the Surrealist movement in France, André Breton admitted that it had not been a "succes d'estime" (see note above) and press reaction was generally negative. Time magazine reviewed the show in their July 21, 1947 issue. Prominently displayed in the gallery window were three rubber female breasts, mounted on velvet. Any knowledgeable Parisian recognized the signs immediately: the Surrealists were back. Up the 21 steps—which 1,500 curious Parisians climbed on the opening day—was Surrealism's first international show since 1938. ... Visitors, on entering, found themselves dodging a whirling lighthouse powered by an old Victrola motor. They moved on to a "Hall of Superstition," containing a 14-foot hand made of chicken wire, plaster and canvas. In a hole in the wall, an owl, a bat and a raven played whist. In another room, artificial rain fell steadily and one dry corner was reserved for a billiard table where passersby could stop and play a bit. Besides witches, whirligigs and a nine-foot Totem of Religion made out of three old railroad ties, the show included some 125 paintings, photographs and wall splotches by Surrealists and fellow travelers of 19 nations, including the top ones: Max Ernst, Hans Arp, Yves Tanguy, Joan Miro, Man Ray. Many admirers of early Surrealism (such as Communist Louis Aragon) felt that the daft old horse had lost its kick. ... Poet Breton, who says that Surrealism (like himself) is now disillusioned with the Communism it once embraced, had a new manifesto. Its theme: "Dreams and revolutions should enter a pact. To dream of a revolution is . . . to carry it out with double strength. . . . Surrealism is what will be." Observers discounted the big talk. Said one: "After the gas chambers, those heaps of bones and teeth and shoes and eyeglasses, what is there left for the poor Surrealists to shock us with?" David Hare who was in Paris during the summer of 1947 gave his impressions of the show in a letter to Donati dated August 8, 1947. The show finely opened after all the various disagreements that you can so well emagin since you remember VVV. However the public didn't know all that so they are labering under the imprestion the surealists are one big happy family. Surrealism is accepted as past history. The gallery is crowded with humanity with nothing better to do on an afternoon. There are no discussions, no fights, no real interest and yet it is a suces as a publicety stunt for the gallery. .one would say it was a popular success, but an intellectual failure... a small group of people amusing themselves with ideas they invented in 1929.
c. July 1947: Arshile Gorky makes a pass at Jeanne Reynal. June 25-28, 1947: The Eleventh National Congress of the French Communist Party takes place. August 1947: The American Federation of Teachers adopts as the theme for their annual (80th) congress, "Strengthening Education for National and World Security." Autumn 1947: Robert Motherwell, Pierre Chareau, Harold Rosenberg and John Cage collaborate on Possibilities magazine. The first and only issue was the winter 1947/48 issue. Motherwell dealt with art, Chareau with architecture, Rosenberg with literature and Cage with music. 1947: Wolfgang Paalen becomes a Mexican citizen. Paalen applied for Mexico citizenship after his application for U.S. citizenship failed. September 1947: Franz Kline moves to 52 East 9th Street. In 1948, Kline shared his apartment for approximately six months with Earl Kerkam who had been a member of The Ten by the time of their final exhibition in 1939. Kerkam would later refer to Kline as a "drunker Mondrian." c. Mid-late 1940s: Franz Kline becomes a regular at the Cedar Street Restaurant and Bar. 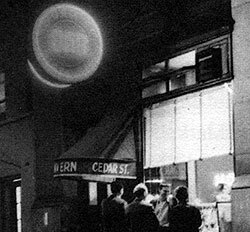 The Cedar would eventually replace the Waldorf Cafeteria as the main hangout (along with the The Club from late 1949) for the Abstract Expressionists during the late 1940s and 1950s. 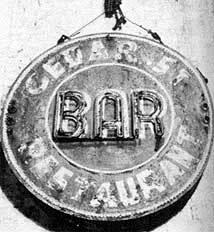 The bar is referred to by various names in accounts of the era - the Cedar, the Cedar Bar, the Cedar Street Tavern etc... As the photographs show below, the name on the entrance canopy was the Cedar Street Tavern. The name on the round neon sign was the Cedar St. Restaurant/Bar. September 9 - 27, 1947: Federation of Modern Painters and Sculptors annual exhibition at Wildstein's. October 1947: First issue of Tiger's Eye is published. The magazine ran for nine issues published from October 1947 to October 1949. Contributors included Barnett Newman, Rufino Tamayo, Mark Rothko, Joan Miro, Adolph Gottlieb, René Magritte, Morris Graves, Max Ernst, Pablo Picasso, Mark Tobey, Robert Motherwell, Yves Tanguy, Jackson Pollock, Clyfford Still, Eugene Berman, Georges Braque, Stephen Spender, Alexander Calder, Hans Arp, Jacques Lipchitz, Isamu Noguchi, Constantin Brancusi, Naum Gabo, William Baziotes, Ad Reinhardt, Georges Bataille, Kurt Seligmann, Maya Deren, John Cage, Alberto Giacometti, Lyonel Feininger, Paul Klee, Georges Rouault, Yves Tanguy, Wassily Kandinsky, Dorothea Tanning, Charles Henri Ford, Louise Bourgeois, Antonin Artaud, Kurt Schwitters, Jean Dubuffet and Jean Genet. October 1947: Clement Greenberg praises Jackson Pollock in Horizon. The October issue of the British magazine Horizon was devoted to American society and art. Horizon was co-edited by Cyril Connolly and Sir Stephen Spender. Spender's son Matthew would later go on to marry Arshile Gorky's daughter, Maro, and write a biography on the artist, From a HIgh Place: A Life Of Arshile Gorky. Art critic Clement Greenberg's comments praising Jackson Pollock in the October issue of Horizon are often quoted but the quotes usually leave out his remarks on David Smith being a "more fully realised" artist than Pollock and Morris Graves and Mark Tobey being more original. Time magazine published excerpts from Greenberg's article when they featured Jackson Pollock in their December issue (see below). October 1947: Jackson Pollock applies for a Guggenheim Fellowship. November 1947: William Baziotes is awarded the Campana Prize for Cyclops. November 6, 1947–January 11, 1948: "Abstract and Surrealist American Art: Fifty–Eighth Annual Exhibition of American Paintings and Sculpture," at the Art Institute of Chicago. November 19, 1947 - January 4, 1948: "2nd Annual Exhibition of Paintings" at the Palace of the Legion of Honor, San Francisco. c. November 1947: Arshile Gorky and his family return to Connecticut. The time at the Hebbeln house was difficult for Gorky and his family. He had become increasingly morose because of his illness and sometimes spoke of suicide. The illness created a gap between him and his wife. He felt embarrassed by his colostomy and resisted his wife's efforts to help him cleanse his wound. November 28, 1947: Mark Rothko signs with the Betty Parsons Gallery. 1947: Franz Kline paints white paintings. Winter 1947-48: Philip Guston paints The Tormentors. The Tomentors is a key work of Guston's as it is almost completely abstract. Previously his work had been mostly figurative. December 1, 1947: Jackson Pollock in Time magazine. In an article titled "The Best?" works by the three artists (Pollock, Smith and Hofmann) that Greenberg had praised as "important" or "major" in his October 1947 article in Horizon were reproduced with some of Greenberg's comments about the artists. The Pollock painting that was reproduced was The Key (1946). December 6, 1947 - January 25, 1948: "1947 Annual Exhibition of Contemporary Painting," at the Whitney Museum of American Art. Arshile Gorky's The Calendars was included. (BA552) Jackson Pollock showed Galaxy (1947). (PP322) The exhibition also included work by Hans Hofmann. December 27, 1947: Arshile Gorky's father dies. End 1947: The U.S. Attorney General issues the first list of subversive organizations. Winter 1947/48: First and only issue of Possibilities magazine is published. See above: "Autumn 1947: Robert Motherwell, Pierre Chareau, Harold Rosenberg and John Cage collaborate on Possibilities magazine." I think of my pictures as dramas; the shapes in the pictures are the performers. They have been created from the need for a group of actors who are able to move dramatically without embarrassment and execute gestures without shame. Neither the action nor the actors can be anticipated, or described in advance. They begin as an unknown adventure in an unknown space. It is at the moment of completion that in a flash of recognition, they are seen to have the quantity and function which was intended. Ideas and plans that existed in the mind at the start were simply the doorway through which one left the world in which they occur. The great cubist pictures thus transcend and belie the implications of the cubist program. End 1947: Barnett Newman moves his studio to a storefront at 304 East 19th Street.